The perfect room divider which makes your small space look bigger. Our room divider for small spaces will not take up a lot of room and it will create the illusion that the space around it is bigger than what it really is. Our hanging room divider Facet, ticks all of these boxes which makes it ideal for small spaces. It is only an inch (2,54 cm) thick and it can be ordered in all sizes. Create a sense of depth. Facet is also an excellent room divider as it is partly see-through which means light can shine through it. To make a small space feel larger, it is important to keep it as light as possible. Our room divider is made up of separate geometric shaped pieces. The spaces in between the separate pieces are completely open. This enables you to catch a glimpse of what is on the other side of the screen. You can even turn the separate pieces around, which allows you to see more of the other side and more light to shine through. By having a partly see-through screen, you create a sense of depth in your small space. Add texture & interest to your small room. Facet has a beautifully unique pattern thanks to the geometric shaped pieces that form the screen. It adds texture and interest to your small room. You can also order it in a selection of different colors, giving you the chance to make sure your room divider complements your space perfectly. You can order it in all kind of different standard sizes, but it is also possible for us to assemble it for you in specific sizes to fit in your space. Our divider is a fully modular system, meaning the screen can be made in almost any size. Even entire walls! Give us a call or send us a message with your special project requests. We love to hear from you and help you to come up with a unique solution for your needs. Installation of our room divider for small spaces is also very easy. The screen is very light and can be attached to any type of ceiling. The step-by-step installation guide and the smart attachment system make it possible for anyone to install it. Our small room divider shown in the photo above gives you an impression of how you can use it to make a small space look bigger. By hanging one room divider more to the front and one more to the back, you can create a sense of depth in your space. The two room dividers also make the space around them look larger because they are so thin. This photo was taken in the industrial showroom of Leolux in Venlo, The Netherlands. 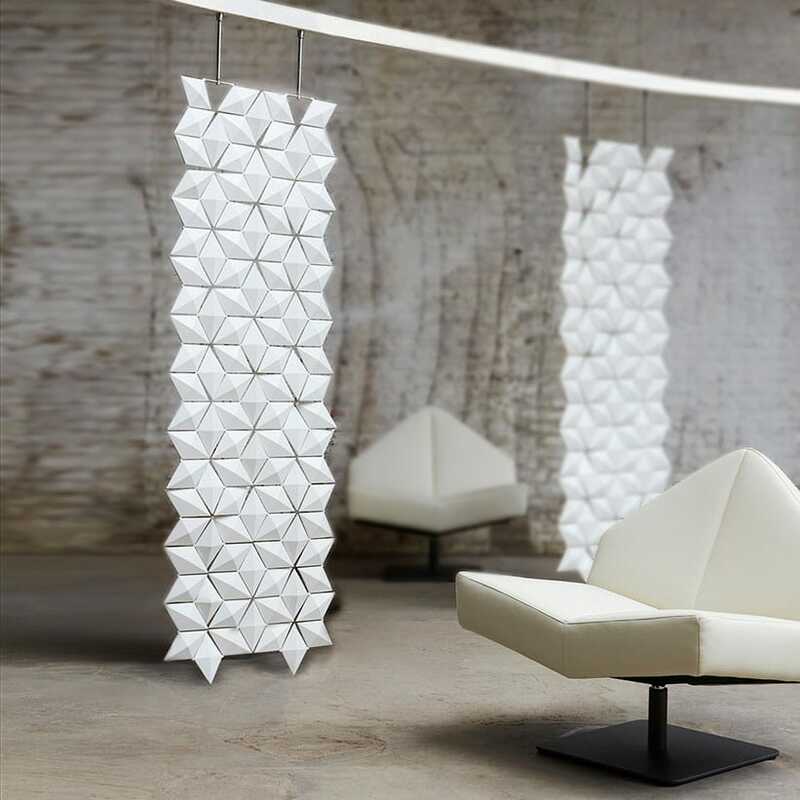 The geometric diamond shape of the facets is perfectly mirrored in the shape of the Leolux chairs.